Industry experts at KBB. com named the 2014 Honda Accord Hybrid (http:// automobiles.honda.com/ accord-hybrid/) and the 2014 Honda Civic Natural Gas (http://automobiles.honda. com/civic-natural-gas/) to their annual list of the 10 Best Green Cars. 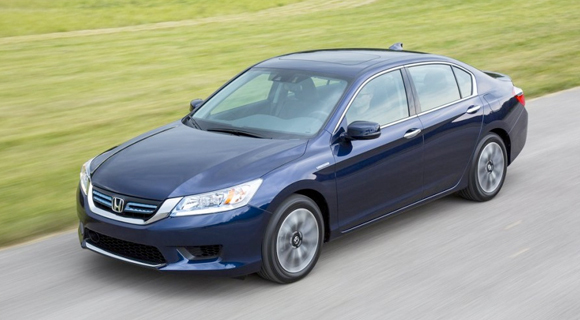 The editors at Kelley Blue Book were impressed by the Accord Hybrid’s superb driving experience and class-leading fuel economy ratings and by the Civic Natural Gas’ use of a domestically sourced, clean-burning fuel. The 2014 Honda Accord Hybrid is designed to deliver outstanding fuel efficiency and fun-to-drive performance and, with a 50 miles per gallon EPA city fuel economy rating,1 it has the highest city mpg rating of any four door sedan. The Accord Hybrid’s two-motor hybrid system, part of an expanding lineup of Honda Earth Dreams Technology™ powertrains, seamlessly blends electric-only, hybrid and engine drive modes along with powerful regenerative braking to provide responsive and efficient performance in a wide range of driving situations. Also earning a spot on KBB.com’s list, the Honda Civic Natural Gas has a combined EPA fuel economy rating of 31 mpg1‡ and an estimated fuel cost savings of up to 40 percent compared to a typical gasoline-powered compact car. The Civic Natural Gas, powered 100 percent by natural gas, can be refueled in a matter of minutes, much like a conventional gasoline powered car. New for 2014, the Civic Natural Gas Leather Navi model gains additional premium features such as leather seats, heated front seats, heated side mirrors and a six-speaker audio system. The Civic Natural Gas’ standard interior has also been upgraded for 2014 with more premium seating materials and door panel trim. 1 Based on 2014 EPA mileage ratings. Use for comparison purposes only. Actual fuel mileage will vary depending on driving conditions, how the vehicle is driven and maintained, lithium-ion battery age/ condition, and other factors. 2 Government 5-Star Safety Ratings are part of NHTSA’s New Car Assessment Program (www. SaferCar.gov). Model tested with standard side airbags (SABs).